This Cactus Sweater has been on repeat since I’ve gotten it. This was my first purchase from “Show Me Your Mumu” and it did not disappoint. It’s the perfect piece to add to your wardrobe during the Spring/Summer months. It’s super lightweight and perfect for cooler nights. 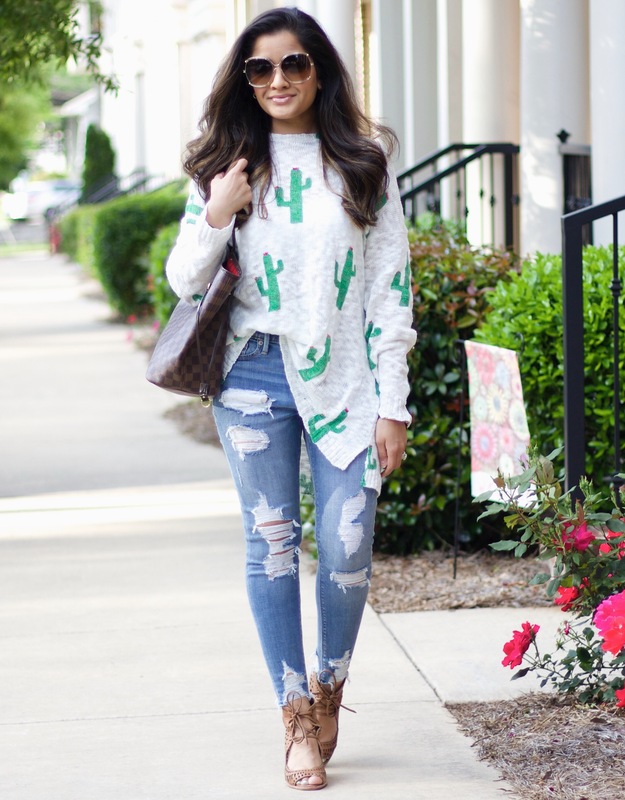 This cactus print has been so popular lately I think it’s so fun and would even make a great cover up. I’m wearing an XS and it does run big, but still looks flattering. If you guys have followed me for awhile you may know that I get most of my jeans from Express. These jeans are my newest addition. I absolutely love the distressed and raw hem look. I snagged these for under $50 when they were on sale. I’m wearing a size 0 Short. 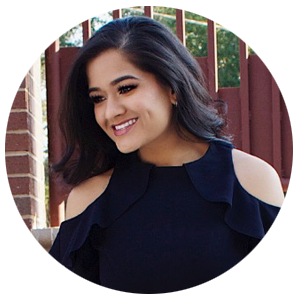 I love Express jeans because they fit perfectly and they offer petite sizes (which saves me time and money from having to get them altered). 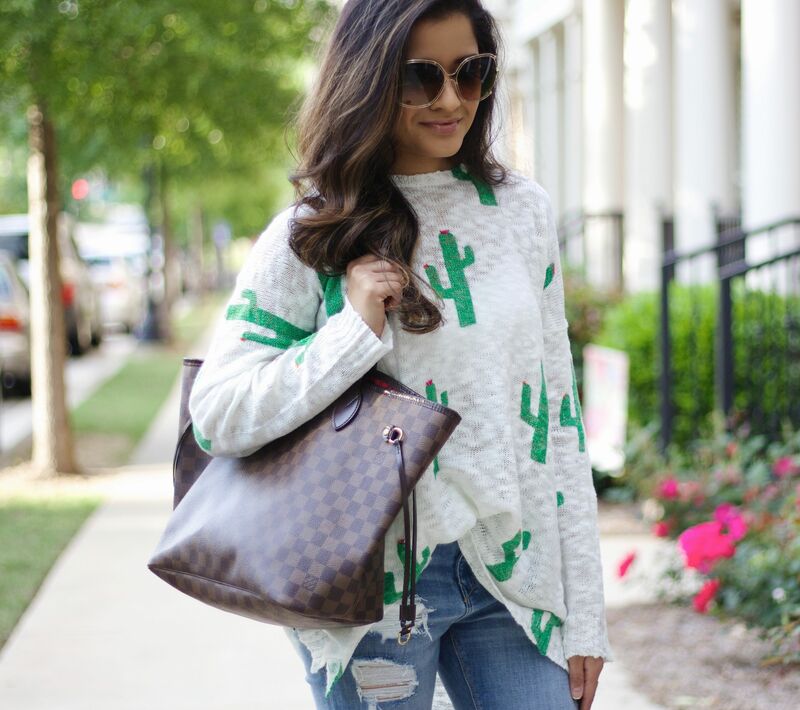 Also, I’m going to be including some more affordable options that are similar to my cactus sweater. I’ll link a few of my favorite tops! I hope you all have a fantastic week! This sweater is sooo cute! I love cactus inspired wear this season haha! Thanks, Adriana! I love the cacti print as well. Thanks girl! I wish I lived in an area where it wasn’t extremely hot. I still try to wear this top on rainy days because that’s how obsessed I am with it, lol. Gorgeous outfit and love how you styled everything together. The cactus print is so cute and I haven’t seen much like it. I’m getting into the distressed jeans trend and starting to embrace it. 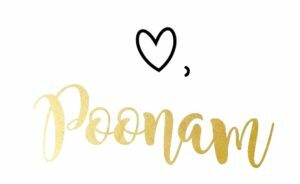 Found your blog through the Facebook group and love your blog dear! Thank you! You’re so sweet. I don’t think I own a pair of jeans without any rips, lol. It’s definitely a more edgy look. Those jeans are to die for! Great price under $50 that’s for sure. I have seen the cactus print around and wondered about it..lol. However, seeing it put together like this, I’m impressed. Great casual outfit for sure. I’m obsessed with anything cactus related! This sweater is too adorable. 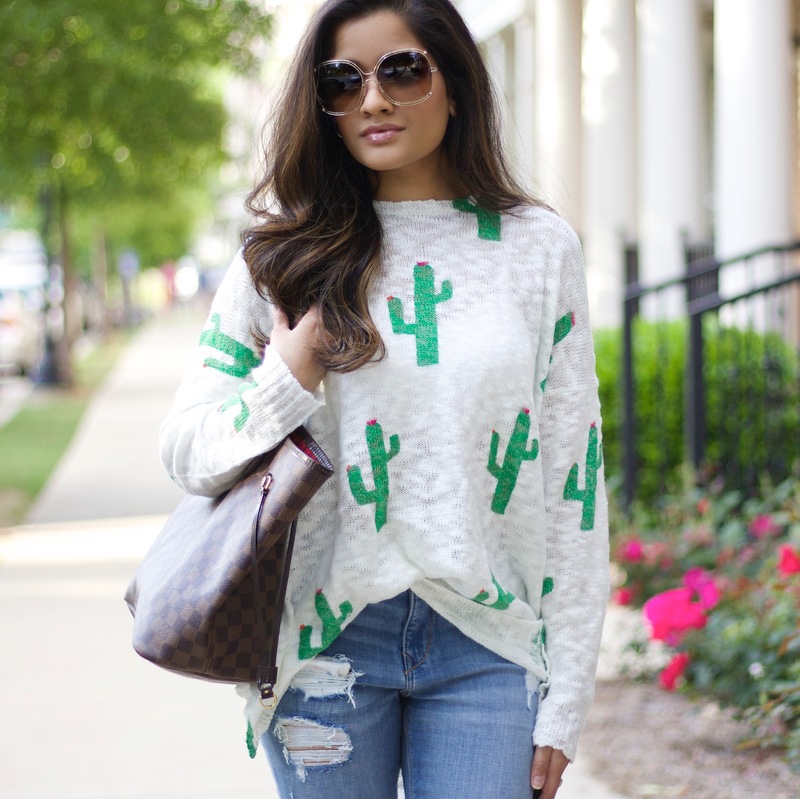 I can’t get over this cactus sweater! I love it! 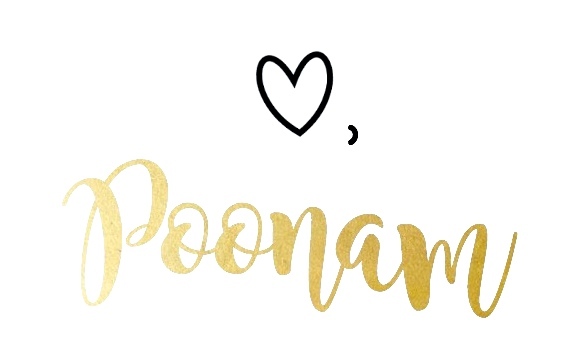 Thank you, Evanne! It’s a must have for sure. I am so obsessed with this sweater! Show Me Your Mumu always has the cutest pieces!! That sweater is so cute! I love the cactus print. 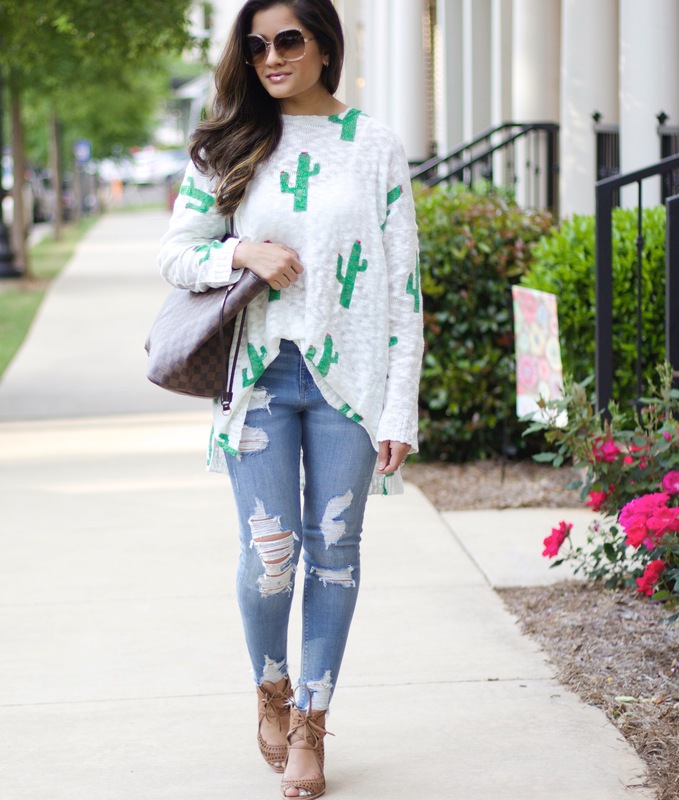 this sweater is so fun and i love the jeans! Cute sweater! I love how long it is! That is the absolute cutest sweater!! I love the print and the fit looks so comfy! 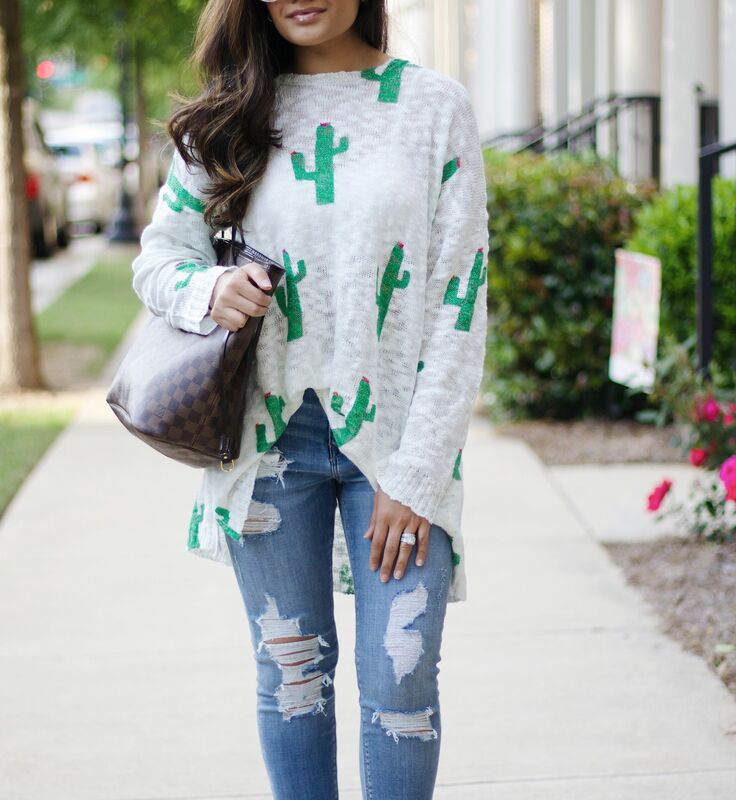 This cactus sweater is so cute! I just bought a cactus tank and I can’t wait to wear it! I’m so obsessed with that print! I just ordered some wedges with the cactus print, too! 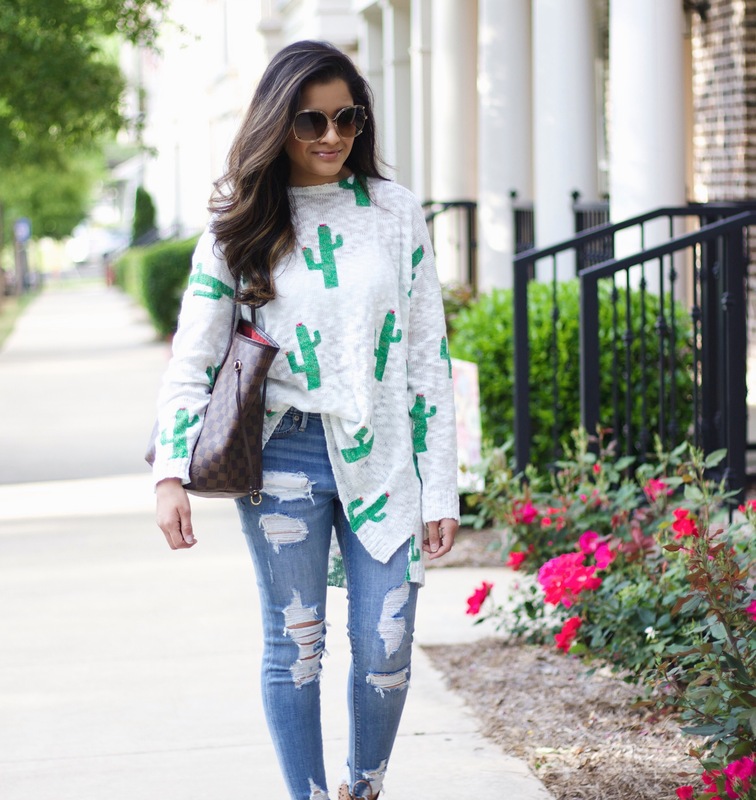 I seriously cannot get enough of the cactus print. It’s quickly become my favorite. I need this sweater in my life! I’m right there with ya! I contemplated getting a back up,lol.